To me, Doughnut Plant takes the doughnut to the haute level. It's not right to really compare it to any others, unless those doughnuts are also $3 a pop. 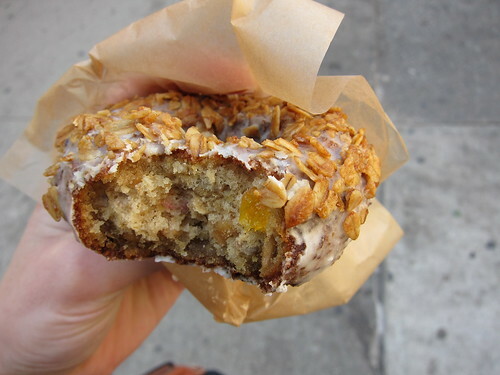 I like doughnuts therefore I like Doughnut Plant, but they're more of extravagant splurges. You would NEVER find my mother waiting 30 minutes in the freezing cold for a $3 doughnut even if it's the size of her face and has boysenberry filling. The cold even wins out against me after 7 minutes. And if you thought the new Chelsea location of Doughnut Plant would cut down on crowds, you're funny and slightly delusional. In between errands this past weekend, I decided I deserved a doughnut. The new location on 23rd Street has a variety of new flavors including oatmeal. This is their take on healthy with half of the dough made from, well, oatmeal. The glazed exterior gave way to a nice cake interior. 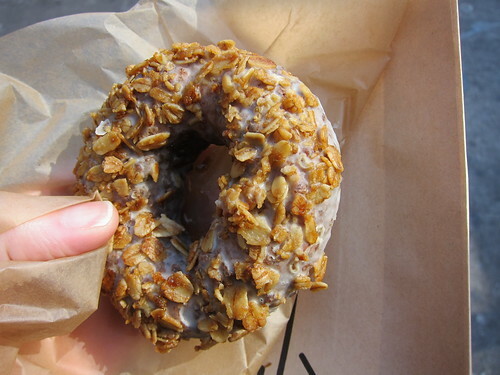 The crunchy granola feeling extends to the fillings: bits of sunflower seeds, dried fruits and nuts are all dotting the doughnut goodness. It almost makes you feel like your doing the right thing, almost. son politely asked if I was bringing home some PB & J donuts and didn't seem to be discouraged by the wait time or the cost!